Are you ready to become the runner you've always wanted to be? Get the entire None to Run plan in a beautiful print out. Also get access to the workout audio files and strength/mobility exercise videos. Join 30,000+ others who have downloaded. Become a runner with a plan that is designed for real beginners. Downloaded more than 30,000 times. WELCOME TO THE NONE TO RUN PLAN FOR BEGINNER RUNNERS! If you can't currently run for more than 5-minutes straight without stopping to catch your breath, you're in the right place. Becoming a consistent runner is hard. You’re struggling to find the time to run. Irregular and demanding work schedules, kids and other commitments make it difficult to give running the time it needs. You have nagging injuries that just won’t go away or experience pain when you run more than 5 or 10-minutes. You’re constantly disappointed with your lack of progress and running just doesn’t seem to get any easier. You get out of breath quickly and wonder why the hell you’re inflicting this pain and discomfort on yourself. Maybe you simply fear looking “bad” when you run? These are just a few of the struggles I hear time and time again. Behind these struggles are the keys to more energy, happiness, weight loss, boosted self-confidence and in my opinion, a better life. If any of this resonates, you're in the right place. I WANT TO RUN AM A RUNNER. This beginner running plan will take you from ground zero, to running comfortably for 25-minutes straight. We're not worried about how far or fast you run and neither should you be. Today, you become a runner and in 12-weeks, a runner for life. 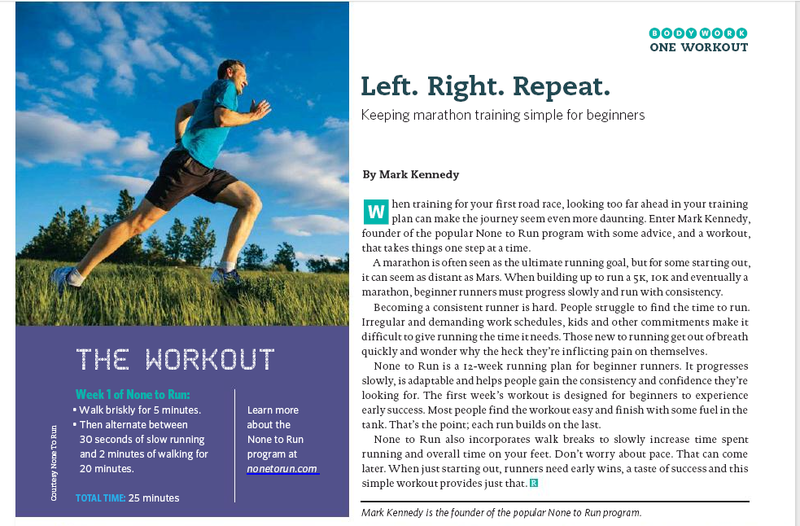 Click here to read the feature in the Sept/Oct edition of Canadian Running Magazine. 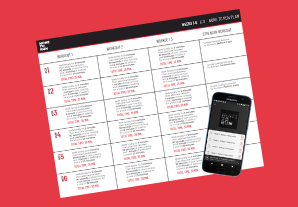 Want a printer-friendly and audio version of the entire training schedule? It's FREE. Just enter your email below and join 13,000+ other beginner runners. Send me the print + audio version! Listen to a sample below. Let me guide you through each workout. It's like having a coach right in your ear buds! “The None to Run program truly made me a runner again. I started running when I was 17 with no guidance - not a good idea. My younger running days consisted of hard training and lots of miles. After suffering from runner’s knee and an ACL tear sustained from skiing, it seemed my running days were over. I tried many running programs to get back into the sport, including Couch to 5k. None of these programs worked. Eventually, I stumbled upon Mark Kennedy’s None to Run program after yet another running related Google search. It is not an understatement to say this program has changed my life. The slow approach combined with strengthening exercises have propelled me back into running - and, drum roll... injury free! I have been back running for the last eight months. During this journey, I have also lost just over ten pounds. “My name is Mimi - 36, mom of 1, wife, former teacher & start over runner! I loved running in my mid-20's and stopped. Life got really busy. I got married. I had a baby. I tried using different plans to get back into running, but frankly they were way too hard & I was ultimately discouraged. I didn't give up on my dreams of running so I did a Google search "Running plan for beginners" and found NONE TO RUN. This program has had this incredible impact on my life! It's helped with not just my physical strength & appearance, but also my mental outlook. I've lost 20 pounds so far & it's made me more productive in my life in general. None to Run is set up for you to taste success and boy does it TASTE GREAT! I'm officially a graduate of the 12 week plan and have moved on the Run to Race 10k. I talk about it every chance I get because I cannot believe I'm running again and running well! Here's a picture of me in April before I started and in September when I finished the 12 week program. "Many years ago, I decided I wanted to run so started running on my own without a plan. Needless to say that was not a good idea because I ended up with a stress fracture in my ankle from doing too much too soon. The following year I sprained the same ankle, ending up with crutches and shortly after that wound up with another stress fracture in my metatarsal of the same foot. I remember my doctor told me to just stick with biking or swimming, which I did for a year or two. After a while, I was bored with the same routine and wanted to try to run again. I knew that I didn't want to make the same mistake of doing too much too soon and so I tried to follow a program. I tried numerous programs that all wound up with the same result....ankle or foot pain and me having to quit. Last year I turned 40 years old and set a goal that I would run my first 5K. Again, I sought out a program to help me achieve my goal. I came across None to Run in a google search and given that it said it was great for someone who cant even run 5 minutes I thought it would be a great pace for me. As I completed the weeks, I was shocked that my ankle was holding up and I was actually able to progress. I think the strength exercises included in the program also helped tremendously by preparing my body for the pavement pounding. I did repeat a week once or twice in the program if I felt it was too hard for me or felt a bit sore but I was able to finish the program!! This was the first time in 15 years that I was able to run for 25 minutes straight without ankle pain. I'm happy to say this past September I completed my first 5K and even though I had to take some walk breaks here and there ( those hills killed me!) , I finished and more importantly my ankle finished the race. I will be turning 41 in two weeks and have set a goal to complete another 5K without any walk breaks! Thank you so much for your program and helping me get over my fear of re-injury, forever grateful!" "I love None to Run!! The plan is created so I'm not overwhelmed! I can feel my endurance building and I can say it worked! I completed my first 5k in October and could've kept on going! Thanks!" "Like many people in their mid-30s I was reflecting on my health and realizing things were changing. My weight was affected more and more by the big slice of chocolate cake, or what ever the splurge may have been. I needed to do something if this time of my life was going to be my "midlife". You know, crossing my fingers I hadn't already missed it. So of course running was the answer. I got out there and literally thought I was going to die. I hadn't prepared at all, I am an athlete afterall. Well, as my longtime friend pointed out, I *USED TO BE* an athlete. Whoa! Reality check. But it was exactly what I needed. Most beginning running plans start you out running 2mins. I simply could not do even that amount. It was humbling. I was quite frustrated and feeling down about how I was going to become a runner without hating every step. Somehow that same evening I stumbled upon None to Run. The simple weekly plans were definitely doable for this former athlete (I'm not really overweight, just out of cardio fitness). If I didn't feel ready to increase after a week, I repeated it. It's okay, I wasn't any less of a runner for taking longer than 12 weeks. Mark and his None to Run plan have given me the tools to be confident again in accomplishing my fitness/health goals." I think the none to run program is great for true beginners. It lets you work up the confidence to just get out and move. Letting you slowly build at your own pace and not feel bad, if a fast walk is your speed when it's time to pick up the pace. I have high hopes that in no time I'll be able to run the whole time straight through, but the balance of walk and jog are perfect for me at this point. Thanks to my little guy I'm at the starting over point. This program is helping me slowly get back to pre- pregnant shape. Looking forward to finishing next yrs triathlon running the whole 5k nonstop. "The None to Run program has been great. I was never a runner per say but was a field hockey player through college and always had IT band issues. I rehabbed constantly but was always plagued by knee pain and would stop running once I was done with my season. I attempted to start running last year as a New Years resolution but pushed myself way too hard too fast and gave up. I had heard about Couch to 5k and was researching it when I came across your article about why not to do it and to follow your plan instead. It made SO much sense as I had never really focused on any strength training while running, especially working to activate my glutes more. I followed the plan since week 1, making sure to complete the strength training portion and have had ZERO knee pain. I only wish I had found this plan 10 years ago! My short term goal is to run a 5k this spring, long term goals now include a 10k and a half marathon. Maybe a full marathon a year from now. The None to Run group on Facebook had been great too because everyone is so supportive!" I love to run. Period. But when my running was derailed by injury coming back was harder than I thought it would be. I was basically starting from scratch in the mileage category, so I began searching for beginner training programs. Almost all of them started with - run 2 miles. Um, I can't run that far. Where is the program that says run as far as you can then rest and don't feel guilty because you only ran a few steps? HERE IT IS! None to Run - N2R - is TRULY a beginner, back from injury, back from a long time without running, or whatever your beginner stage is program. The training is based on a slow build and steady progress and is easy to follow. I also like that there are strength and stretch pieces included. Mark is amazingly supportive and the only timeline is yours. This no pressure, supportive, slow build running program is exactly what I personally needed and I am so happy to have found N2R. I feel confident that I can finish the program and move on to the next phase of running which is a goal I was beginning to think was out of reach. Thank you, Mark, for being out there for all of us beginners! I'm very excited to be a part of N2R and am looking forward to a future race day and moving to the next phase with N2R. "Can i start off by saying I am not a runner. I decided in Aug of 2016 to make a life style change, i started eating better, cleaner, healthier and had lost about 30 pounds then in Jan of 2017 my weight loss had stalled drastically it seemed like overnight. So I decided I needed to start exercising but what kind of exercise could I do, I am a stay at home mom of a almost toddler a preschooler and I was still over 200 lbs. I thought well I don't know many marathon runners that are heavy, maybe I should give it a try. I didn't much enjoy that choice because I had tried running in the past and it really hurt, my shins, my knees, you name it, I tried other running programs and would injure myself within the first couple of weeks and have to continually start over. Then, life changed, I found the None to run program, some things that were different, I didn't have to run a certain distance, I could repeat a day or a week of the program ( which I did often). I could do this at my own pace, moving on when I felt ready so I didn't injure myself. The strength exercise videos are a must! They really helped me to strengthen my muscles, my body so I could safely progress. I think doing them have also helped my form so I could continue to run and to do what my body really needed. I still use the program, have completed the 12 weeks program in 8 months and have now ran my first ever 5K. When I started, I was 212 lbs I am now right at a year from starting and am weighing in at 138 lbs. I am stronger physically and more importantly mentally from following the none to run program. Please if you are looking for something to help you change your life and to find the joy in running, this is it!" "None to Run was transformative for me! I have tried other walk to run programs before and ended up injured or quit. None to Run was the right pace for me to keep on going. I love that it's based on time and not distance. There were some challenging times and sometimes I would really rather lie on the couch. But I don't, I get out there. I was having some back pain a few weeks ago and I ended up at the chiropractor figuring I was going to be taking a break, But no! The doc said, "Keep going!" At this point, I have finished the program and can run for 30 minutes without stopping!" "Started your program second week of January. I’m 57 and after a week I figured I was going to stick with it so I bought a pair of running shoes and signed up for a March 10th 5K. I did the early days on the treadmill and the Tuesday before the race was able to run 25 minutes without stopping. Believe me when I say I started from zero. Was so proud when I could run for 5 mins early on in the program. On race day I finished in 37:32 and run three times a week now. My next race is end of April!" The None to Run program was precisely what I needed! I had tried other training programs, but they all were missing that extra ‘something’ to keep me un-injured! I tried the Couch to 5k, and it took two calf strains to make me see I needed more. When I read about None to Run, I was skeptical, given my history, but really wanted to get back to running. I started off just walking and doing some of the glute work, squats, and other body weight exercises. Then I pulled up the audio for the runs, and everything just clicked. With that reassuring voice in my headphones, keeping the pace and sticking with the program were easy. That was several months ago, and I have since completed the Cotton Row Run 10K on Memorial Day, and am on track to run the Rocket City Half Marathon in December. I’m a runner again, and am believing Jeff Galloway’s “Run Until You’re 100!” philosophy; I’m only 60 (until next week!). I stumbled across None To Run while researching different programs to help me become a "runner". I've always dreaded the in-laws yearly 5K Turkey Trot each Thanksgiving morning. I was always the one sitting on the sidelines. As a runner in high school and somewhat athletic, I felt like there was no reason to be sitting out, but I needed something to help me build up my stamina again, and my confidence. That's when I came across your program. The hardest part so far for me was the mental challenge and worry that I wouldn't be able to do it. Wow, was I wrong! I put off Day 1 for several weeks and had many excuses (including my foot is still healing from bunion surgery, although my surgeon cleared me for activity!) but overcoming the mental hurdle was a breakthrough and Day 1 went off without a hitch. The program is very doable and challenging without being completely overwhelming. One of my favourite parts of the program is the online support from the other members. Everyone is so uplifting and positive of one another and there's always someone who can relate to whatever particle struggle you may have. After my first post on Day 1, I was beyond thrilled with the outpouring of "likes" and comments of encouragement. I've already recommended the program to several friends of mine who are looking to get into shape and need accountability and a schedule to keep them moving forward. I'm a real advocate for this program and no matter what level of shape someone is in, it's doable, and not nearly as awful as I had myself convinced it would be! Thank you for creating this program for me and the thousands of others who are now runners because of you! I began the None to Run Program last spring. I was on my high school track team and have run many different times over the years. I've done my own training, the Couch to 5K, and a 1/2 Marathon Training Program. In all those attempts over the years (I'm 59 years old), I have never been able to achieve the ability to run the distances I have with your program. I've recommended it to everyone! It's is great for anyone who's willing to follow your program and be patient with themselves. I've completed the basic None to Run program and am working on the 5K Training Program now. Thank you for making running fun! On Wednesday, last week, I was on week 13.I finished 12 weeks of the none-to-run plan and decided to up my time to 28 minutes running to keep prepping for my 5K. Wednesday was run 2 of the week. IT WAS TOUGH. I though it would never end. I questioned why I was even doing it and what did it really serve. Then I got to the end of the 28 minutes and was so thankful to be done. Friday, I did the third 28 minute run and it felt glorious for the first 16 minutes. SIXTEEN minutes of joyful running. 13 weeks ago I was running - what - 30 seconds with 2 minutes of walking in between. To think of how far this program has brought me in just 13 weeks!!!! Thank you Mark! You helped me recognize the power within my body and the joy of running! Thank you for creating the None to Run program! I’ve been inactive for several years and wasn’t sure how to start back into any sort of routine. I found your program, and it’s exactly what I needed! I love the way you gradually transition us into more challenging weeks. The strength routines that are incorporated into the program are great, too. I didn’t see that in other programs I considered. I am tracking my progress and love to see my distances increase and feel my endurance increase. I’m also losing weight, which is a definite added bonus! I would highly recommend this program to anyone considering running for the first time or returning to exercise after a long break like me. I’m almost done with the 12-week program and plan to run my first 5k on Thanksgiving with my son – that’s something to be grateful for! “My son and I found the plan very useful. We both used it to train successfully for a 5K. He was in the progress of earning his personal fitness merit badge and used the program as part of his training. I have tried couch to 5K in the past but was unable to finish it. The none to run program is so much easier to do. “I started the None to Run plan training for my first 5K after i hurt my knees. I wasn’t sure I would be strong enough, but None to Run made me stronger and eased me into a great training schedule! “Like many people in their mid-30s I was reflecting on my health and realizing things were changing. My weight was affected more and more by the big slice of chocolate cake, or whatever the splurge may have been. I needed to do something if this time of my life was going to be my “midlife”. You know, crossing my fingers I hadn’t already missed it. So of course running was the answer. I got out there and literally thought I was going to die. I hadn’t prepared at all, I am an athlete after all. Well, as my long-time friend pointed out, I *USED TO BE* an athlete. Whoa! Reality check,but it was exactly what I needed. Most beginning running plans start you out running 2mins. I simply could not do even that amount. It was humbling. I was quite frustrated and feeling down about how I was going to become a runner without hating every step. Somehow that same evening I stumbled upon None to Run. The simple weekly plans were definitely doable for this former athlete (I’m not really overweight, just out of cardio fitness). If I didn’t feel ready to increase after a week, I repeated it. It’s okay, I wasn’t any less of a runner for taking longer than 12 weeks. “I’ve tried the C25K several times, and due to severe asthma it was very difficult for me to progress and I always gave up because I couldn’t keep up with the program requirements. “Your None to Run program gave me the confidence to get out there and keep the start of my running journey fun and injury free. I used to run, and allowed myself to stop and gain a ridiculous amount of weight. Insert excuses here. I started your program running at 280 pounds and three months later am 256 pounds and can run 3 miles without stopping (my route has hills too)! I am slowly increasing distance, and average a 13 minute mile. More importantly, I have energy, mood stabilization, and can work my 12 hour shifts as a busy ER nurse without feeling exhausted. My goal is to lose 100 pounds and continue to run for fun and health. “I found None to Run thru a web search looking for ways to start running. I hadn’t run since I was in the military over 20 years ago, and even then I didn’t run better than a 10 minute mile over 2 miles. I’m hoping to do a triathlon this summer and needed to ease into activity. I used to run. I used to lift. I used to weigh a lot less than I do now. But two kids, two failed marriages, and graduate school later, my life looks a lot different. I know one thing: I missed that feeling. I missed the feeling of running, of being fit, of feeling like I matter, and like it’s okay to do things for myself. None to Run has helped me get that back. Granted, I’m not where I want to be yet, but, by following the None to Run program, I’ve been able to make giant strides in that direction. I’m running again. I’m taking care of myself. I’m making progress. This program has met me where I’m at and made forward momentum possible. Too much too soon and I go nowhere. None to Run was just enough of a push to get me started and keep me going. And it feels amazing when I get to check off each workout as done! I’m looking forward to the rest of my runs, and to many wonderful runs in the future. “Here’s the thing - I’m not a “run” yet but I’m not a “none” anymore. Your program is the first one that’s given awkward, klutzy fat-girl me the feeling that I can and I will and that I’m not stuck as the klutzy fat girl forever. It’s not “talent,” but consistency on the journey is what’s important. “I have been trying to run for years. Every time I try, I get really motivated and eventually stop because nothing works. I was using the couch to 5K app, but after a certain point it couldn’t help me as it didn’t give you the tools that some beginner runners need to make it all the way. “Mental health is just as important as physical health. None to Run did more than improve my physical health and help me get in better shape. It has become a coping mechanism for me when I am struggling with my anxiety and PTSD symptoms. Each week, you'll perform the same workout 3 times. See the FAQ at the bottom of the page some for further clarification on the plan. Success! Now check your email to confirm we have the correct email address. Send print + audio version! 1 Walk briskly for 5-minutes. Then alternate between 30- seconds of slow running and 2-minutes of walking for a total of 20-minutes. Walk briskly for 5-minutes. Then alternate between 30-seconds of slow running and 2-minutes of walking for a total of 20-minutes. Walk briskly for 5-minutes. Then alternate between 30-seconds of slow running and 2-minutes of walking for a total of 20-minutes. Simple Strength Routine for Runners. Perform 2 sets. 2 Walk briskly for 5-minutes. Then alternate between 60-seconds of slow running and 2-minutes of walking for a total of 20-minutes. Walk briskly for 5-minutes. Then alternate between 60-seconds of slow running and 2-minutes of walking for a total of 20-minutes. Walk briskly for 5-minutes. Then alternate between 60-seconds of slow running and 2-minutes of walking for a total of 20-minutes. Simple Strength Routine for Runners. Perform 2 sets. 3 Walk briskly for 5-minutes. Then alternate between 1-minute of slow running and 2-minutes of walking for a total of 25-minutes. Walk briskly for 5-minutes. Then alternate between 1-minute of slow running and 2-minutes of walking for a total of 25-minutes. Walk briskly for 5-minutes. Then alternate between 1-minute of slow running and 2-minutes of walking for a total of 25-minutes. Simple Strength Routine for Runners. Perform 2 sets. 4 Walk briskly for 5-minutes. Then alternate between 90-seconds of slow running and 2-minutes of walking for a total of 25-minutes. Walk briskly for 5-minutes. Then alternate between 90-seconds of slow running and 2-minutes of walking for a total of 25-minutes. Walk briskly for 5-minutes. Then alternate between 90-seconds of slow running and 2-minutes of walking for a total of 25-minutes. Simple Strength Routine for Runners. Perform 2 sets. The strength workouts should be performed once per week. You can perform the strength workouts on your days off from running or immediately after a run. Let me be clear. I do not run. Ever. I felt overwhelmed by the idea of starting to run and didn't even know where to begin. A friend recommended None to Run to help me get started and the program has been amazing! When I first started I would get side pains by the time I ran one block. But now I'm nearing my 5k and can run 2 miles without stopping! One thing I loved when I first started the program was Mark saying "A lot of people say they feel insecure about how they look when they run" that was actually one of my biggest fears. I was afraid people would judge me or look at me and instantly know I had no clue what I was doing. And being thin everyone assumes I'm fit, and only running a few minutes on a treadmill would tire me out. None to Run gave me confidence, helped me realize that my feelings / fears were totally normal, and that anyone can run! I never thought I could even run a mile and I've already doubled a seemingly impossible goal. The None to Run program helped me grow, learn how to breath, and to pace myself along the way. I've even bought my first pair of legit running shoes - like hello! Who is this person!? I now run a few times a week with my trusty running coach Mark - and my dog Gunnar. Thanks Mark for being the best running coach I've ever had!" About 8 months ago I had decided to try running as a form of exercise and stress relief, part of an overall life shift stemming from entering trauma recovery therapy for C-PTSD. I had never been a runner, though I swam competitively and played field hockey in high school. I was fairly active at work and didn't think it would be too difficult to start up, even though I knew I was 32, a bit overweight, and not in the greatest shape. I knew about the C25K program so I started that, but a few weeks in I developed a case of runner's knee. After some rest I tried again, taking things a bit slower. Another week or so went by and then something painful flashed through my back and hip during a run. That took me completely out for a couple months. I got frustrated, and went about searching for more information and alternatives while I rested up. Eventually I found None to Run and it sounded exactly like what I needed. I read about the strength training portions and started to understand my previous injuries and why they happened. I got so excited that even though it was late December in Philadelphia, I printed out the plan, bought an extra pair of sweats to throw over my running pants, and started up. By the end of the first week I was hooked. This is a program I could do! I didn't injure myself again! My confidence in myself grew, I could feel my body slowly getting stronger. I didn’t mind (well, not too much), when I had to repeat weeks because of life getting hectic or just deciding I wasn’t totally ready to move on yet. I got excited to check in with the N2R community online, another wonderful benefit I never knew I needed until I had it. I'm starting the Run to Race program now, and I know I'm going to keep going after because I have no desire to stop. Even though I'm still healing up that second back/hip injury, my doctors have told me that the strength and stability training Mark includes with the course, combined with the gradual increments None to Run encouraged, have benefited the recovery process. If you've ever wanted to run but didn't know where to start, you're here. This is it. Want the printer-friendly and audio version of the entire training schedule? Just enter your email below. It's FREE. Get 10% off your next order at Running Warehouse. Use the coupon code "healthy10" at checkout. Q: Who is the None to Run plan for? I want it to be for beginner runners, real beginner runners, who might not be ready to start a plan like Couch to 5K. If you can't run for more than 10-minutes without stopping to catch your breath, this plan will work really well for you. While Couch to 5K is an excellent place to start for many people as well, there are a few flaws that I have written about here. Q: Do I have to run on specific days? No. You can do your workouts on any day (or time) you choose. The only caveat is that you never run two days in a row. A rest day in between is essential for beginners to help reduce chances of injury and to allow the body get the rest it needs. Q: Why are the workouts prescribed by time instead of distance? Q: Is it okay to repeat a particular week? Yes! If there is a particular week that was too challenging, listen to your body and repeat the week before progressing to the next. Please note that there are a couple of weeks that are already repeated to help you progress at a sustainable (and enjoyable) level. Q: Week 10 looks like a HUGE jump from week 9. What’s with that?? Q: When should I perform the strength workouts? The strength workouts can be performed on any day you choose, even after a run (but not before). Q: What is the easiest way to remember the workouts while I am doing them? I recommend either entering your email address at the bottom of the page to get the audio versions of each workout. Alternatively, you can create custom workouts with the RunKeeper app or simply bring write the walk/run ratios on your hand so you remember! Q: Can I perform the entire training plan on a treadmill? Yes! While I prefer to run outdoors, I realize many people prefer the treadmill. Especially in the cold winter months. So, run wherever you can. “Thanks for creating a program that has helped me begin to learn to enjoy running! For me, timing my run-walk cycles has been the key vs. trying to go a specific distance. I don’t feel like I’m working so hard that I never want to put on my shoes again- and I’m sticking to it without injury, which is a big deal for a 40+ year old woman! Want a printer-friendly version for the fridge to guide you through each workout? Enter your email address below and I'll send it right over! It's totally FREE! As USATF (USA Track and Field) certified coach and a former Kinesiologist, I created my blog, Healthynomics, as a personal outlet for me to stay in touch with my passion of exercise science and healthy living. My work has been featured in places like RunKeeper, Strength Running, The Globe and Mail, CBC News and Lifehacker. Lately, my focus has been on helping beginner runners get started. None2Run is an amazing program! I have tried other beginning running programs in the past and lasted days not weeks. I was convinced I couldn’t do it. I started None to run in January 2018. I started the program because I need to improve my self-esteem. I have always been overweight and NOTHING I have tried has helped me lose weight, which is very discouraging. So, I started to let my health go, by not exercising. I started to notice I was getting winded just walking up the half set of stairs in my house. I decided that even if I didn’t lose one pound I wanted to be strong and as fit as possible. I chose running because it was intimidating for me, something I thought I was just to fat to do. I ran across none to run and Mark wrote it was a true beginner program, so I committed to finishing the program. I printed off the program and ticked off the days, I didn’t look at the scale because I didn’t want to get discouraged. I did, however, take my measurements and I lost several inches over my body. I did finish the program and I’m now working on the 10k program for a race in Jan 2019. I don’t know if I lost any weight, but I do know I gained strength and confidence. I can now walk up several flights of stairs no problem. I can also run a 5k no problem, which I never thought I could do. I recommend none to run to anyone who wants to try running. I am stronger mentally and physically thanks to none to run!